OK - I've been reading about the "Gotts" approach to a CAI mod long enough that I decided to try it. Here's what I did - and I take no credit at all for any of this, it was just my implementation of the excellent ideas put out by people that came before me. 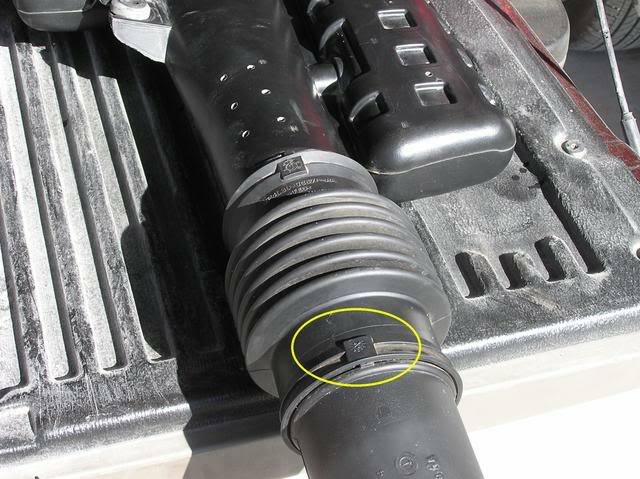 In the 2004-2008 trucks, the intake snorkel has only a 2" diameter at the end where it goes into the fender well. 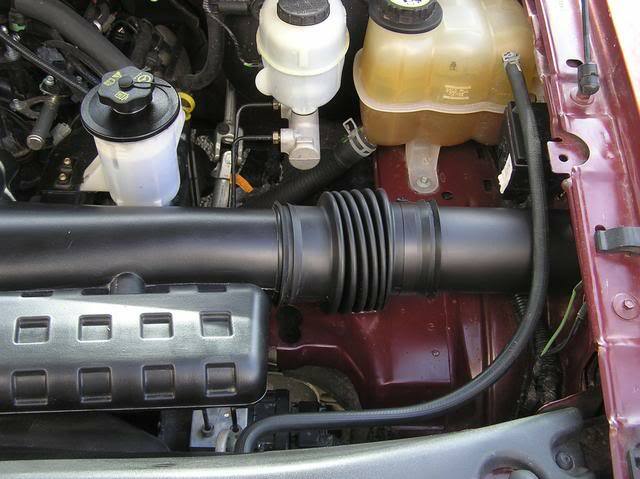 Other than that, it's a Cold Air Intake - so, the goal is to increase the intake opening. We start with the intake ducting. 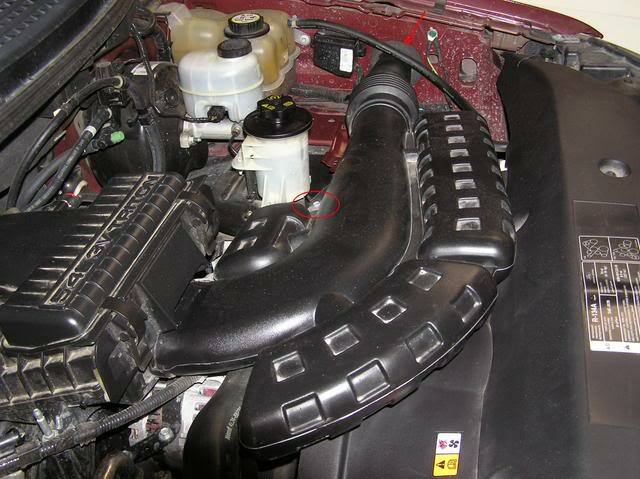 Remove the hold down screw (red circle) in the picture below using a 10mm socket and pull the snorkel out of the fender wall (red arrow). 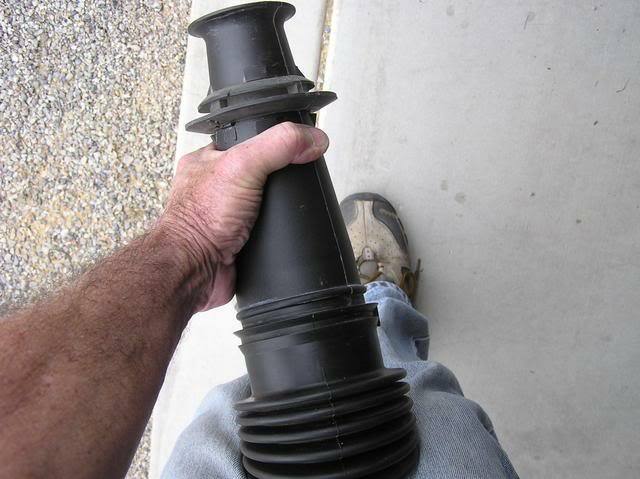 Once you do that, you can pull the duct away from the filter box. It will make a lot of noise that sounds like something is breaking - just smile and ignore the bad sounds. You can also ignore the dirty fender wall in this picture - it just shows my truck is actually used and is not a "Garage Queen". To do this, I put the duct and bellows between my knees and then twisted the snorkel (where I'm holding it with one hand) all the way around, and it comes right off. (I had to use two hands to do this, but in the picture, one hand was holding the camera). Now that the pieces are apart, compare the 2" flared opening of the snorkel that fits inside the fender with the over 3" opening of the duct at the bellows and you see why the engine might have trouble getting enough air at WOT. I went to Home Depot and bought a 2 ft length of 3" ABS pipe and a 3" stainless hose clamp. I wanted to make sure my new duct went into the fender as far as the original snorkel, so I marked my new 3" tube with a white line to match the gasket position. The hardest part: I had to reshape the end of my new snorkel tube back to the white line to match the 3 1/4 x 3 1/2 oval opening. 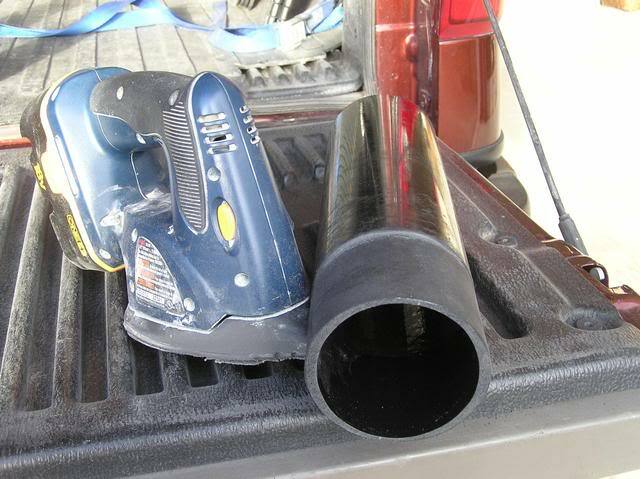 I used a "Mouse" sander, pictured here with the end of the tube that I shaped. Last edited by Bluejay; 03-07-2009 at 12:42 AM. 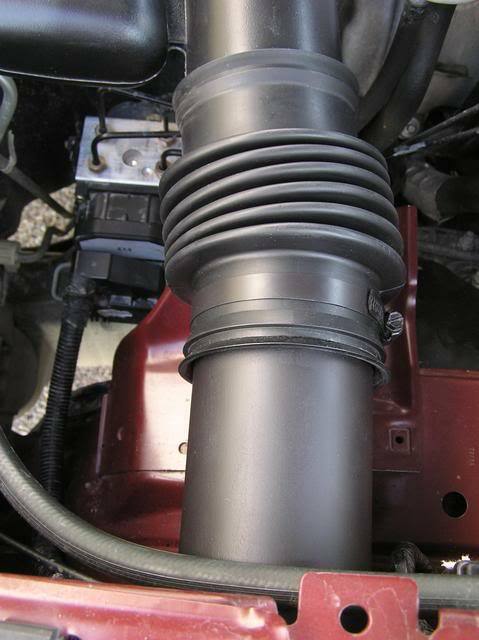 Here's the finished tube, looking straight down the intake end. The outer surface is cut down so it will just fit into the fender opening and is a 3 1/4" x 3 1/2" oval. The inside opening is a true 3" circular intake. 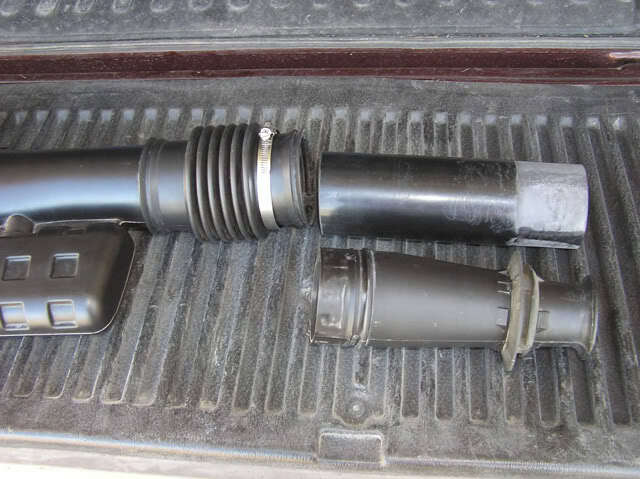 The new snorkel tube will have to be angled slightly from the rest of the intake to fit into the fender properly. (It needs to enter the fender at close to a right angle), so, the other end of the tube was cut at an angle try to match the truck's tube opening angle. The length of the new snorkel on the long side is 10 5/8". The length of the short side is 10 3/8". (It's about the same length now as the original snorkel). The hose clamp will be used to stabilize things. I put my new snorkel into the fender (at a right angle) and it goes in right up to the line where I stopped shaping it. It's actually through the second hole in the inside of the fender at this point. It fits quite tightly through the opening, so I'm not worried about it getting "warm" engine air. Then, I slipped the bellows down over it. (Hey, I wiped my fender wall off a bit)! I compressed the bellows pretty much to give it some room to expand under engine torque and not pull the tube out of the fender wall. I noticed that earlier, when I had slid the bellows down the tube farther, it had pulled the tube out about 1/2 inch after a hard acceleration (because the engine twists away from the fender wall in this state). It's a fairly neat assembly, and even though the airflow curve is not as "smooth" as I'd like, I think it directs the flow fairly well. Best of all, the total cost was under $8.00. ($0.99 for the hose clamp and about $6.50 for the ABS pipe). And, it's something that is completely reversible if desired. 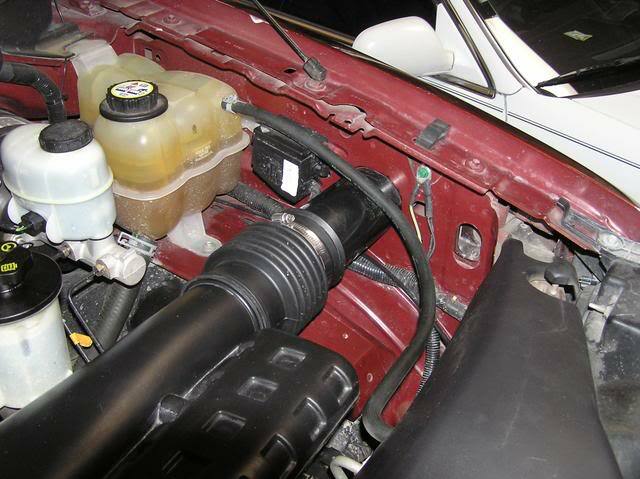 The new snorkel can be taken off and the original put back in and no one will be the wiser. 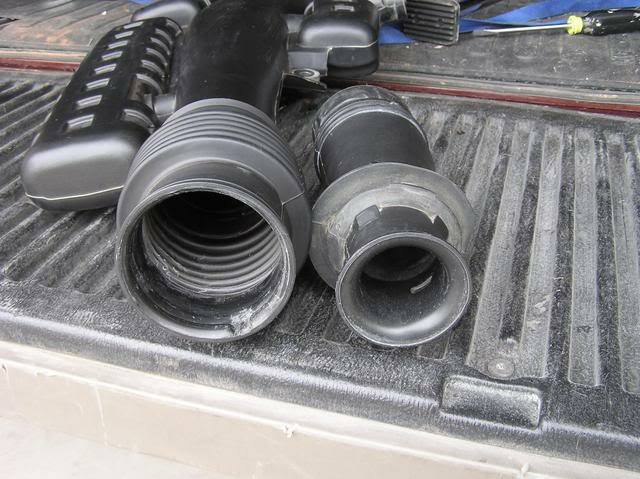 Because the cross-sectional area of the snorkel varies with the square of the radius, the new snorkel has an opening that is about 7.07 square inches compared to just 3.14 square inches for the original snorkel. That's over twice the intake capacity! 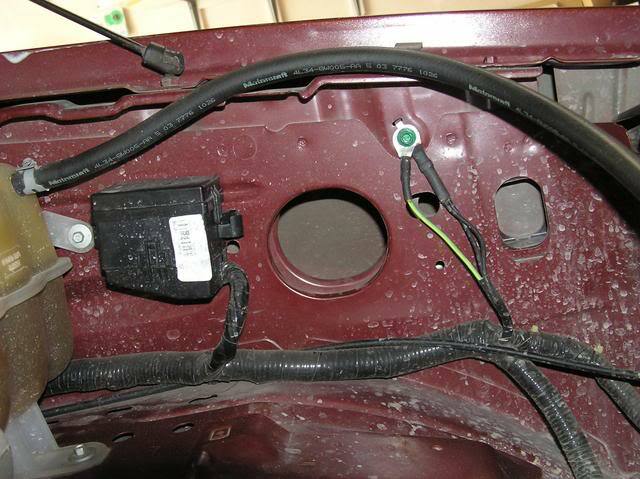 Since the modification does not change the environment of the MAF sensor above the air filter, it will not be "fooled" and there is no danger of the engine running lean. There is no "drone" with this CAI. While some people have recommended disconnecting the battery so the PCM can "relearn" the new system, there's really nothing for it to learn. In fact, here is a quote from Bill Cohron at Power Hungry Performance: "Don't bother with the battery. There's really no reason to mess with it when doing the snorkel mod. All that's really happening is that the modest restriction is being alleviated allowing a little more flow at higher RPM. 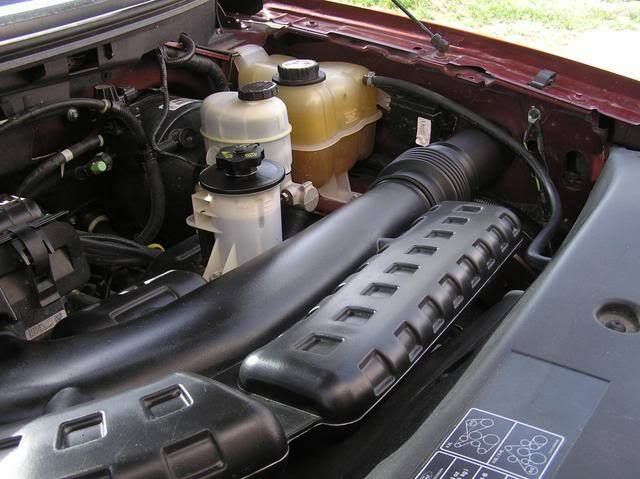 However, this mod DOES NOT AFFECT the Mass Airflow Sensor and doesn't significantly change AFR like a CAI does. The MAF sensor still accurately reflects the airflow into the engine and the computer handles everything from there." I hope this writeup can be useful if you decide to try it yourself. For those of you that are lazy like me you can just remove the tube that run's into the fender well and it add's a noticable increase in power and better throttle response. With this setup my IAT's ran about the same as the outside temperature except when setting still idiling. I also got a jig saw and cut the muffler's off which improved the under hood appearance. As I said at the beginning of this thread, I can't take credit for the idea, only my implementation. Here is one I learned the details of after I had posted my version on the PHP forums that had actually appeared in f150online, some time before I joined all of you. Because everyone scoffed at the idea at the time, David had Rockpick remove it. For those of you who don't know him, David's screen name is kd4crs. They are silencers. The noise would be loud without them. They can be cut off and the holes plugged. I cut them off mine because I wanted it louder. 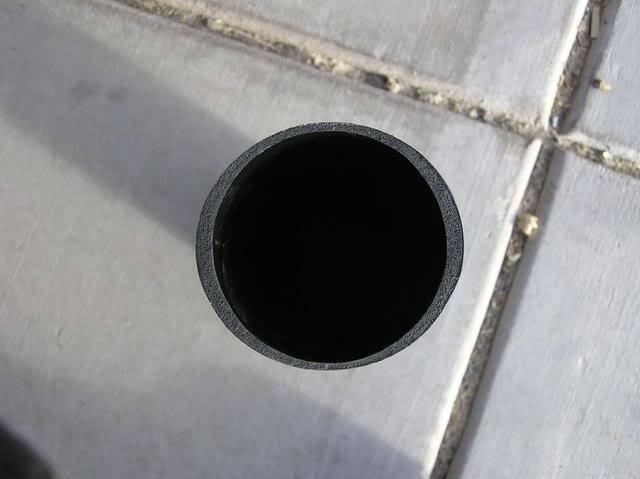 I just used 1.5" black electrical tape and wrapped it around the tube multiple times to cover the holes. do you guys think this would cause any serious problems or should i just tape it up when i do it this weekend? hope this helps you and good luck! Nice install! 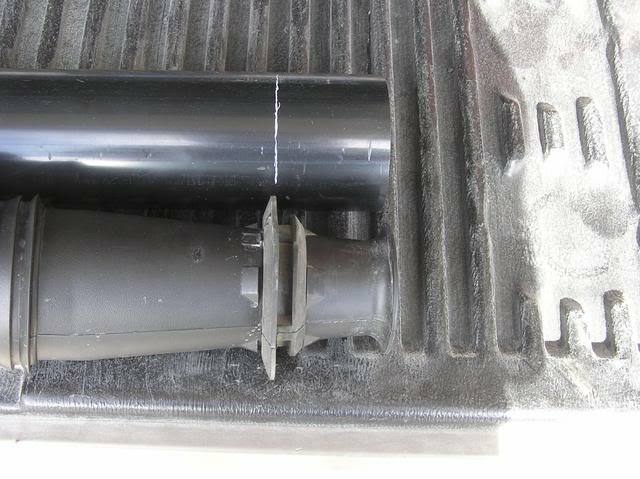 Hey, how'd you get the muffler section off & make the tube look all round instead of with the factory flat edges? does cutting the mufflers off do anything besides make it louder?? and what do you guys actually mean that it gets louder?? No, only makes it louder. It sounds more like a hurricane at WOT. More wind noise in a pipe.